APPSC Group-3 Panchayat Secretary Posts Recruitment Notification 2018-Apply Online APPSC Group-3 Panchayat Secretary Posts Recruitment Notification 2018-Apply Online . Andhra Pradesh State govt notification released to fill 1051 Panchayat Secretary (Grade-IV) in A.P. Panchayat Raj Subordinate Service for a total of 51 CF and 1000 Fresh vacancies in the State.APPSC Group III Posts, APPSC Panchayat Raj Secretaries Recruitment 2018 notification: APPSC Panchayat Raj Secretary posts 2018. APPSC has released Panchayat Raj Secretary posts Recruitment 2018 vide Notification Panchayat Secretary (Grade - IV) In A.P. Panchayat Raj Subordinate Service (General Recruitment) and invited online applications from qualified candidates to the post of Panchayat Raj Secretaries in Panchayat Raj Department in the State of Andhra Pradesh. APPSC Panchayat Raj Secretaries Grade IV Recruitment 2018 notification. 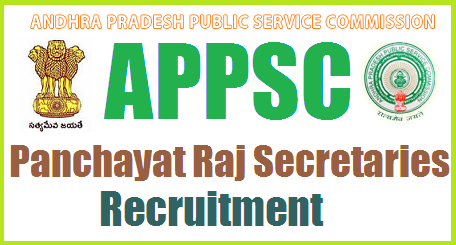 APPSC Panchayat Raj Secretaries Grade IV Recruitment 2018, Group III Services posts online application form, Application Fee, Eligibility Criteria, Selection Procedure, Last date for apply online, Exam date, Exam pattern, Syllabus, Hall tickets, Results declaration, Selection List preparation, Certificates verification , District wise Vacancy Position Details are available at Detailed Notification and more details available on Commission’s Website (www.psc.ap.gov.in). Sl. No Name of the Post Vacancies Age as on 01/07/2018 Min. Max. Scale of Pay Rs. No person shall be eligible for direct recruitment if he/she is less than 18 years of age and if he/she is more than 42 years of age as on 01/07/2018. The Panchayat Raj Act (1994) of A.P state orders the duties of Panchayat Secretary. The duties and responsibilities are changed frequently. Recently the government of A.P order 51 types of duties and responsibilities that are mentioned below. Panchayat Secretary is having a responsibility to take the decisions of the committee members. The candidate who are starting his career as a panchayat secretary will be grown up from executive officer to Panchayat Raj and Rural development officer. They got promotions based on their experience. ➧The Commission conducts Screening test in Off- Line mode in case applicants exceed 25,000 in number and is likely to be held on :21/04/2019. ➧The main examination in On-Line mode for candidates selected in screening test will be held through computer based test on 02/08/2019. The objective type question papers are to be answered on computer system. For applying to the post, the applicant has to visit www.psc.ap.gov.in and click the corresponding link given there or alternatively use the URL to directly access the application.